Mount Etna observatory, historical artwork. 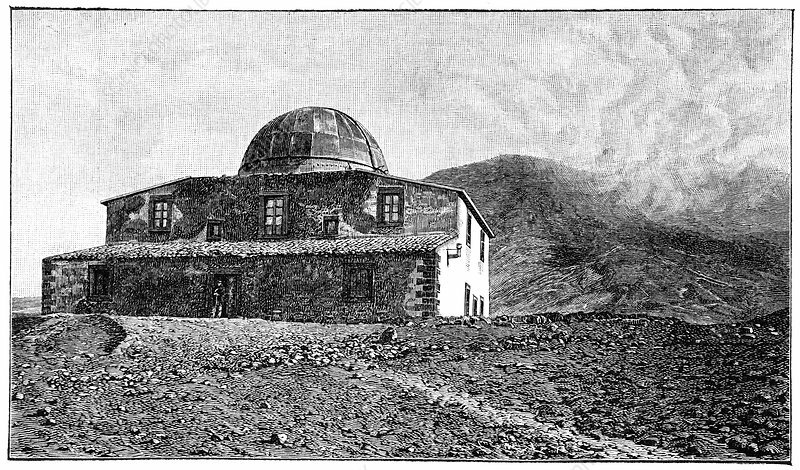 The construction of this observatory, at 2941 metres on the slopes of the volcano Mount Etna, Sicily, Italy, began in 1879. It was planned as an astronomical observatory and facility, hence the domed cupola, but a volcanological section was added during construction. Italian volcanologist Orazio Silvestri was the first director from 1881. After he died in 1890, the observatory fell into disuse. It was used again from 1926, but was destroyed in an eruption in 1971. Artwork from the third edition of 'Les Entrailles de la Terre' (1902) by French author Eugene Caustier.